We store mental snapshots of those who have gone before us. They are a shorthand remembrance for legacies of a broader and deeper scope. When my father died, a friend wrote a tender note and included an acorn. She said my father was like a strong oak, and the acorn was my legacy. The Smithsonian Museum’s Legacies exhibit contains artifacts that are reminders of well-known historical and pop culture figures, such as the compass used on the Lewis and Clark Expedition of 1804, Evil Knievel’s jumpsuit and motorcycle, GI dog tags from World War II, Minnie Pearl’s hat and Mr. Rogers’ sweater. I have long carried a snapshot in my head of President George Herbert Walker Bush. It is the image of a consummate diplomat, one who possesses tact, is at ease forging relationships and adept at negotiations. My copy of “All the Best, George Bush” is fringed with Post-it tabs marking numerous passages worthy of a second read. They aren’t career or political accomplishments, but examples of how to handle difficult situations, encourage others and hold fast to hope and a vision for the future. 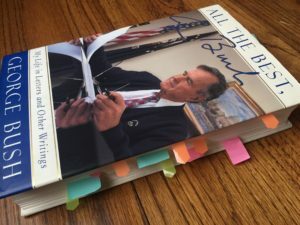 Those abilities seemed innate to Bush, apparent in a letter written to his mother after he joined the Navy the day he graduated high school as a rather innocent 18-year-old, in somewhat jovial correspondence with government officials and even in notes on a meeting with an angry, red-in-the face Henry Kissinger. Much of his writing ended with an upbeat note, a dash of wit or a shot of encouragement. Like most of us, Bush possessed strong opinions, but they were tempered by finesse and grace. Maybe that’s what humility looks like. Good will and kindness seemed to be part of his DNA. When he left his post as chief of the U.S. Liaison’s Office in China, the staff who served him by cooking, cleaning and maintaining the residence was genuinely sad to see him leave. How many employees feel like that about a boss heading toward the exit? When he was President, cameras often zoomed in on him at a ballgame and he’d be mouthing the words to a country song playing in the stadium. Comfortable with himself and comfortable with others, essential qualities for navigating the barbed world of politics. He was deliberate and candid about noting things that had gone well and things that hadn’t gone well. His writings reveal an ability to place things in context and see another’s point of view. How old school. We could use more of that today. His ability to lead and unite was astounding as he quickly assembled one of the largest coalitions in history when Iraq invaded Kuwait. How does someone do that? History will be the judge of 41 as a president. As a human being, he’d be the first to say he wasn’t perfect. On our best days, we live life trying to reflect the goodness of our Maker. If, by the grace of God, we have a number of good days, we build a strong legacy. We leave memories, attitudes, habits and ways of treating others that will be remembered long after we are gone. Bush 41 may have died, but his legacy of goodness is very much alive.